Between March 25 and 26, the Ecumenical Service Coordination received the 7th edition of the CESE and Social Movements. The event was attended by a diversity of popular movements and organizations from the countryside, forests, water and city, as well as international cooperation agencies. Held every two years, the meeting is a moment of institutional strengthening, a space for dialogue about the context of the movements and the actions needed to strengthen them. The two days of the meeting were dedicated to the collective reflection on the impacts of the political conjuncture for the populations of women, indigenous peoples, black people, fishermen, fisherwomen, shellfish workers, rural workers, traditional populations, urban movements, environmentalists, agro ecological, human rights, coexistence with the semi-arid, solidarity economy, communication, education, ecumenical and religious leaderships, and youth, among others. Political strategies of advocacy for rights and countless forms of resistance have also been drawn. Post truths, fake news, militarization of politics, growth of conservatism and intolerance, discourses of hatred. These points were repeated in several presentations of the five groups that were formed on the morning of the 26th, when the movements were invited to systematize their views on how their territories and the country have been affected in face of the aegis of authoritarian managements. 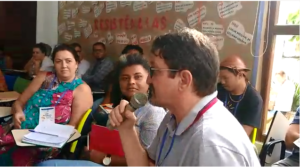 Analyzing all the points listed, Joilson Santana, from the Brazilian Forum of Solidary Economy / CAMA, emphasizes that it is no longer possible to dissociate the discussion of race from all these reflections. Paulo Carbonari, of the National Human Rights Movement, agrees, reaffirming the importance of not abandoning the intersectionality to unify the struggles. According to the researcher Carla Akotirene, intersectionality is a theoretical and methodological tool used to think about the structural inseparability of racism, capitalism and cisheteropatriarchy, and the articulations resulting from this junction. People from the countryside and from the forests have denounced the violations of fundamental rights that they have been suffering in their territories. Denildo Moraes, of the National Coordination of Articulation of Rural Black Communities (CONAQ), has shed light on the weakening that the land demarcation process tends to suffer from here on, since the responsibility for its implementation was passed on to the Ministry of Agriculture (occupied by the landowners base). Edilena Krikati (COIAB) brings the assassination and persecution of leaderships and the agenda of the municipalization of indigenous health as points that affect the good living and subsistence of the indigenous people. Ana Gualberto, from Koinonia, points the African and indigenous knowledge as a key to cross this historical moment. “The good living of the indigenous people is for all. The one of the African based people also – it is for the elements of nature, like stone, water, as well as for black women, white men and women. The African concepts are revolutionary and we will not give them up, as well as the indigenous concepts”, he emphasizes. The second and last day of the meeting was devoted to the elaboration of coping strategies in the face of this scenario of so many losses. It was when, at the back of the room, timidly, the cordel poet Anselmo Ferreira de Sousa appeared, reciting a collection of impressions on the two days, in the melodious and cadenced form of the cordel poem, thrilling those who can see their struggles rewritten and reinvented by the look and voice of the popular culture.